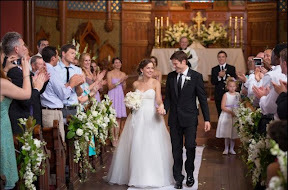 While leaving a message for his bride on his ever present video camera with which Zach McCall (Zach Gilford) has pledged to document the start of their new life together, he makes a promise to the lovely Sam (Allison Miller) that he will always protect her and keep her safe. But as we learn not even twenty minutes into Radio Silence filmmakers Matt Bettinelli-Olpin and Tyler Gillett’s demonic baby chiller Devil’s Due, Zach has spoken much too soon after a bizarre night on their honeymoon in the Dominican Republic finds his wife not only pregnant but acting completely different from her usual self. Arriving on disc a full month before NBC premiered their own thematically similar miniseries remake of Roman Polanski’s 1968 horror classic Rosemary’s Baby, while Devil’s Due takes you down familiar terrain by playing deliberate and at times humorously tongue-in-cheek homage to Polanski’s original, it’s pieced together in a way that’s less stagey and far more naturalistic. Much like Fox’s Chronicle (with whom Devil shares a producer), the movie’s classification as a work of pure found footage horror is up for debate since multiple source videos are somehow edited together by "unknown parties" in addition to an online sequence wherein some footage is erased. Admittedly predictable, although the directors realize there’s simply no getting around the fact that we’ve all seen this movie before, they do their best to take each opportunity they have to ratchet up the tension or offer a unique spin on the tried and true formula of Lindsay Devlin’s script. And this is evident in the clever Kubrickian inspired twisted delight they take in serving up a spine-tingling Motown era musical counterpoint where the lyrics of the catchy “Oogum Boogum" foreshadow and later provide a commentary on the eerie events that follow. Likewise, making the most of its unusual natural camera-centric focus by tapping into grocery store and parking lot security cameras for two jaw-dropping scenes, Devil’s Due illustrates the truism that necessity really is the mother of invention in forcing the helmers to think outside the box. While it had the potential makings of a much more original storyline by alluding early on to the fact that Sam had no memory of her parents who died in a car crash before abandoning that thread altogether, far too often, Devlin’s script retreats back into the expected realm of a Rosemary’s Baby retread instead of daring to pay-off on that unique premise. Although it doesn’t achieve the same level of success that D.J. Caruso’s Disturbia did in providing a contemporary, new take on an old classic with Caruso's thrilling tribute to Hitchcock’s Rear Window that provided viewers with a creepier comeuppance and a fresh point-of-view, overall the filmmakers make the most of what they’ve been given. Augmented by the emphasis on Hitchcock-like voyeurism that fills the second half as more camera flood the lives of our characters without their knowledge, Devil’s Due amps up the suspense considerably by using the strategy to capture eerie scenes both in and outside the couple’s home as they’re hounded by the eyes of Big Brother everywhere. With an exceptional Holy Communion centerpiece sequence that infuses the work with shades of The Exorcist, while most filmmakers would’ve blown most of their budget on a big CG payoff there, the film is that much more arresting given the helmers’ strong dedication to documenting the events with understated realism. And while there’s nothing earth-shattering about the work as a whole, it’s saved by these little artistic flourishes that keep us invested. Filled with flashes of innovation and intriguing shifts in first person camera point-of-view by those behind the camera, as we watch the increasingly desperate Zach attempt to make good on his wedding day promise to keep his wife safe, come hell, high water, unholy cab drivers or baby antichrists, we realize that the Devil’s due is truly in the details.